The only reason I FOIAd’s the State Police report for the accident involving the Normal West student who died earlier this year was because of a tip from a reader. If you didn’t know, the driver of the vehicle who hit her was the son of Bloomington’s Fire Chief, Brian Mohr. Mitchel Mohr was a volunteer firefighter in the Carlock Fire Department. It appears the readers questions were justified. ISP obtained video of the crash from a surveillance camera in the area. They could clearly tell when the light changed. Two people witnessed the crash, one was behind the victim. Both told ISP the light was green from the victims direction. I believe one witness was a nurse. The second witness was a fire fighter from El Paso. Both rendered aid until EMS arrived. The troubling part is ISP received permission from the victim’s mother to examine her cell phone. The reports indicate she was not using it at the time of the crash. Mitchel was only ASKED if he was using his cell phone. There was no mention in the reports that his cell phone was examined the way the victim’s was. Why was that? Officers on the scene reported not smelling alcohol from Mohr, but blood and urine tests were run at the hospital. The report indicated no alcohol or drugs present. The report shows a conflict in the color of the lights at the time of the crash. The surveillance video shows the light yellow from Mohr’s direction. Both witnesses claim the victim had a green light when she entered the intersection. The reports do not mention the discrepancy. Mohr was driving the truck headed South. He told ISP he was trying to beat a yellow light. The surveillance video claims the light was yellow at the time of the crash. Two witnesses claim the victim had a green light. How did she enter the intersection on a green light, get clear across the intersection, and then get hit by a truck with a yellow light? Why was an examination of Mohr’s phone not done? The two reports I received show more questions than answers. It’s a tragedy for all involved. The lights don’t make any sense and neither does ISP not examining Mohr’s phone. I purposely didn’t link the reports in respect to the victim’s family. I will email them upon request. Posted in BloNo, Local, Normal, State.Tagged cell phone, Illinois State Police, Mitchel Mohr, traffic accident, traffic lights. I am a little confused with the drawings here. It appears according to this drawing that the truck and car ended up south-west of the intersection. As I came home from Peoria around 18:30 I the vehicles had been removed, but all the people were gathered in the median west of the north bound lane of route 150, or south-east of the intersection. Even tire marks were present in that median. In fact days later the memorial was in the location I just described. The accident reconstruction team hasn’t finished their investigation. Maybe it will show something different. I drive through this intersection twice a day. The memorial (and tire tracks) are in the grassy area to the southwest of the intersection. The memorial has been replenished multiple times since the accident and is still there today. Any clue why none of this appears in the circuit clerk records? State Police did the investigation, it should eventually appear in the court records. Can you please email me these reports? Sounds fishy to me. THIS intersection AND the one at 150 and college BOTH have lights that change WAY too fast for small vehicles, let alone LARGE trucks to stop in a REASONABLE distance! A friend of mine was hit years back at the the latter and was hit so hard that he bit part of his tongue off. EITHER UPTOWN or more likely IDOT NEEDS to look at BOTH of these intersections and CHANGE the timing on the green to red lights, as I have almost been hit by people on a yellow light, and a large truck just CANNOT stop as fast as the lights change, The skid marks on the road are proof enough.. These are BOTH very bad intersections and just waiting for ANOTHER victim.. 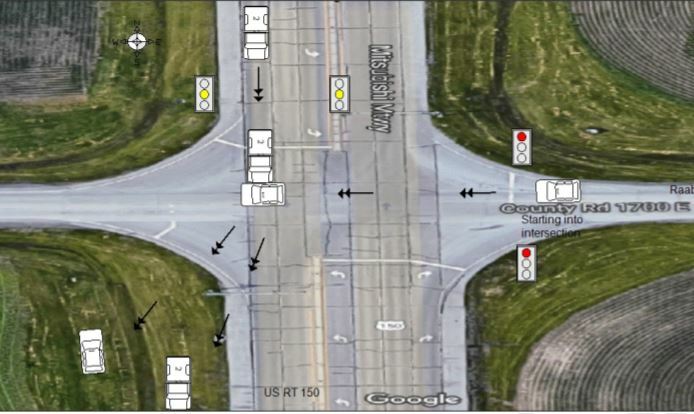 There is NO REASON for either of these intersections to have the lights change as fast as they do. PERIOD! It appears the Pantagraph is following in your footsteps…getting their story leads from you. Can you email the reports to me?